Trying to eat healthy but desperately craving comfort food? While you might think those are opposite extremes, our new Spicy Lentil Soup Mix is proof that you can have your cake and eat it, too (so to speak). 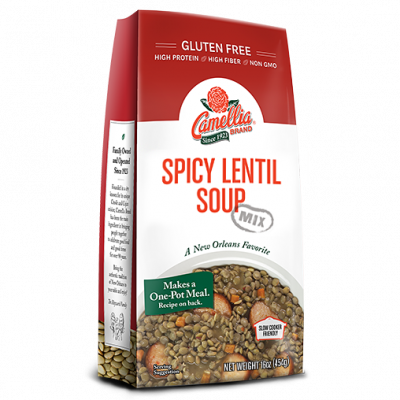 Gluten-free and full of protein and fiber, this Lentil Soup Mix is healthy, easy to prepare, and hearty in a wholly satisfying way. 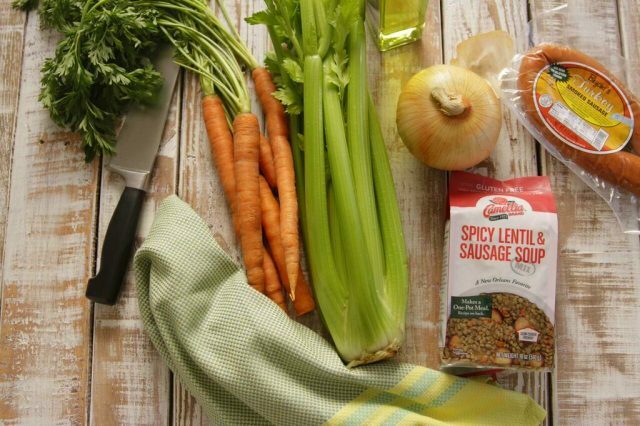 Starting with the simple recipe that’s right on the back of the bag, just add a few fresh ingredients, and simmer on the stovetop or in your slow cooker. 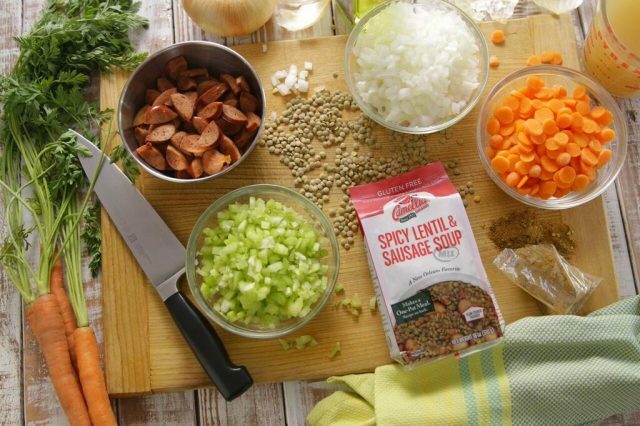 Of course, by making smart choices when it comes to those fresh ingredients, you can customize the recipe to lower the fat and up the nutrition – without sacrificing flavor or comfort. 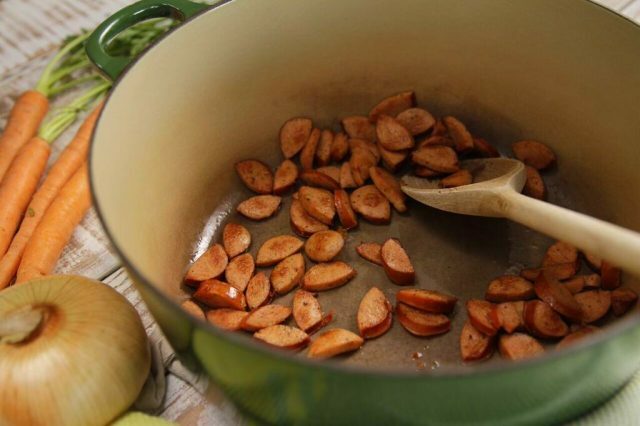 First off, the recipe calls for a pound of smoked sausage. 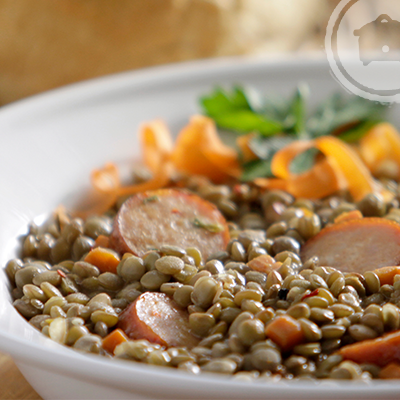 So, try a leaner protein choice by using smoked turkey or chicken sausage, like we did here. You’ll still get all that savory, umami flavor, but with a lot less fat. Just slice it up, brown it in a tablespoon of olive oil in a large, heavy pot, then remove it from the pot, and set aside. Next up – tender-crisp, healthy veggies. 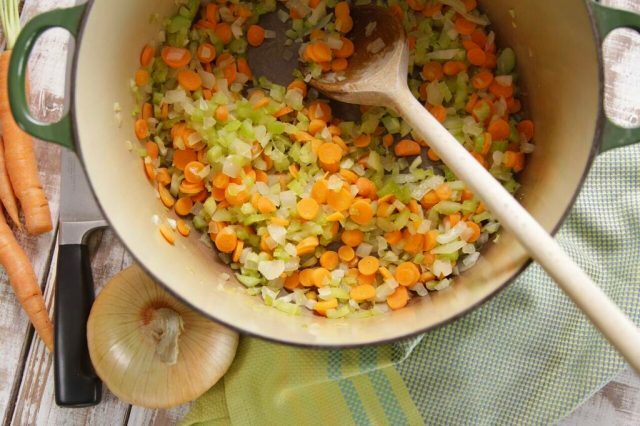 To the pot, add another tablespoon of olive oil, and sauté chopped carrots, onion, and celery for about 5 minutes, or until the veggies start to soften. 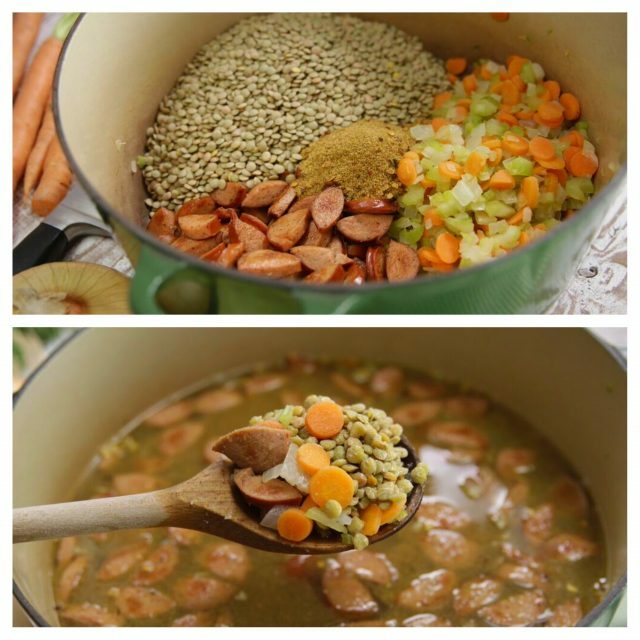 Now simply add the sausage back to the pot along with water, chicken broth, the lentils, and the contents of the enclosed seasoning packet (a great combo of spices including garlic and cumin that you can adjust to your taste). 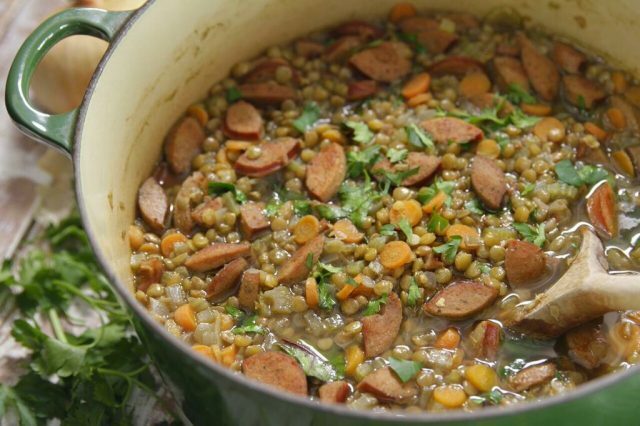 Bring to a boil, reduce the heat, then cover and simmer for 20-35 minutes, depending on how you prefer the texture of the lentils. 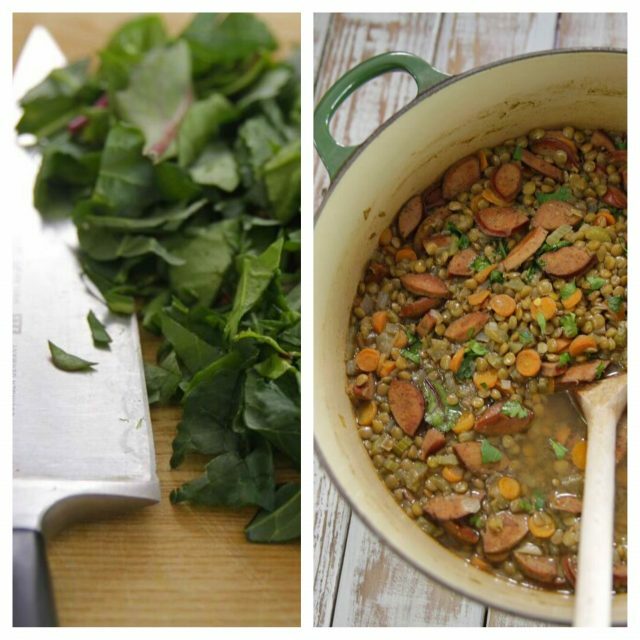 Not only are lentils full of folic acid, iron, and magnesium, but they cook fast, too, which is a nice bonus. Want another health-conscious tweak? Just before serving, try stirring in some roughly chopped spinach, kale, Swiss chard, or a combo of all three. 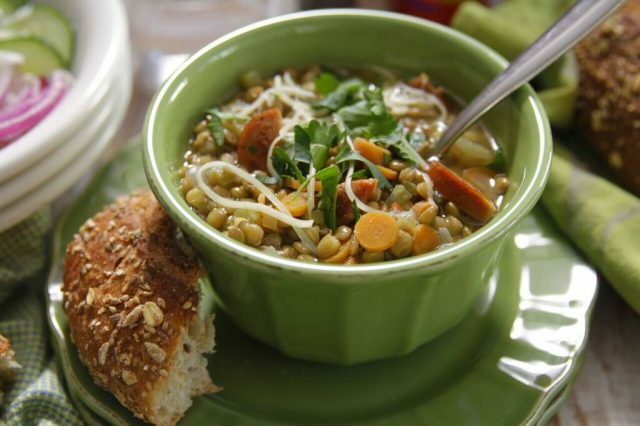 Greens are a great-tasting addition to lentil soup, pack a punch of vitamins and minerals, and will increase your veggie intake for the day. Now ladle into soup bowls and top with a little shredded Parmesan and chopped parsley. Serve with a crunchy salad and multigrain bread, and enjoy a healthy, delicious meal that’ll satisfy your cravings and make you feel good about what you’re putting in your body. 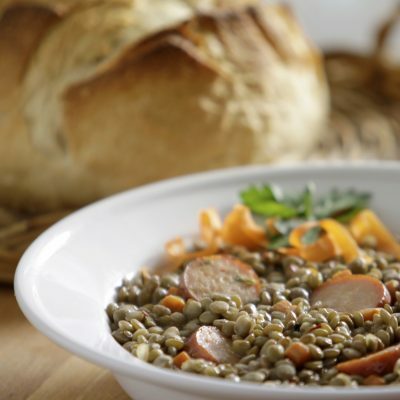 Get the stovetop recipe for Spicy Lentil Soup and the slow cooker recipe for Spicy Lentil Soup.